Garage doors may look simple, but in reality they are actually quite complicated. When things go wrong the average home handyman can get an idea in his head that the required repairs are relatively simple. This line of thinking is wrong and can have serious consequences. One false move when trying to fix a garage door the DIY way can result in a serious injury or lead to an even more expensive repair than first anticipated. There are some common misconceptions that people believe to be true, and we want to make sure you don't put yourself at risk without knowing it. Garage door extension springs degrade over time and occasionally one will be completely worn out while the other may still be usable. If you have one worn spring you may be tempted to save a little money and only replace that one. The trouble is, the new one will not be able to compensate the constant movement of the door alone, and the one that you chose to leave in place won't be as strong, and will most likely be close to breaking too. This can result in your door becoming misaligned which can cause a load of other problems. Replacing both units may cost a little more at first, but you'll be able to avoid having to go through the whole process again when the old spring wears out, and you'll save money on damage that can occur due to an unexpected break downs. 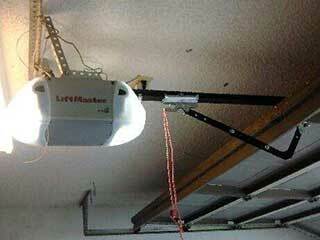 Don’t be fooled into thinking a slow moving garage door poses no risk. There a many reasons why a door starts to move slowly and any one of those reasons can result in your door suddenly coming down with a crash. Considering the weight of the door, anything or anyone that is underneath it at the time is bound to be damaged or hurt. If your door is functioning slower than usual, get it checked as soon as possible. Many people mistakenly believe that the motor unit that powers and initiates the door's closing and opening is the one that supports most of its weight. That is completely untrue. The lift cables and the springs are the ones that are in charge of that, which is why they need to be checked periodically and replaced as soon as any fraying, cuts or malformations become visible. Remember, replacing cables and springs can be dangerous, so you're better off letting our experts at Garage Door Repair Woodstock handle it, to avoid getting seriously hurt accidently.